I saw Elena et les hommes last night but I couldn’t tell you what it was about, not really. It’s an elegant farce about a Polish Princess down to her last pearl who goes on a roundelay of possible husbands including Jean Marais and Mel Ferrer, all madly in love with her. She in turn is in love with making them live up to what she sees as their potential, helping to make them be the men she thinks they ought to be, which in the case of Jean Marais means becoming President of the Republic. It’s a charming film, funny, endearing; lots of people chase after each other in a small house whilst Ingrid Bergman, at her scattiest and blondest, looks impossibly beautiful in tight Belle Epoque corsets, figure-hugging skirts and hats large enough to hold a small meadow or a large aviary. What prompted me to write a note here is that from the very beginning of the film one is dazzled by the beauty of the colour. The opening title seems encased in bright little bombons or be-ribboned jewels of glistening red, blue and yellow. Jean is Auguste Renoir’s son of course but the cinematographer here is the equally great Claude Renoir, newphew of the director, grandson of the painter. Uncle and newphew both knew something about colour, composition, perspective and this film is their evocation, their particular articulation of what they learned from Auguste. ‘The only reason I’m writing a note on the film here is that from the first shot one is dazzled by the beauty of the colours. Claude Renoir did the cinematography. I saw it on a gorgeous 35 mm print where the brightness, density, luminosity, the texture, the fine grain of the celluloid brought out every delicate variation of light and texture in hats and feathers and gave one the impression of partaking in breathtaking beauty’. Needless to say, I’m an idiot, and upon looking at the program I realized that what I had in fact been seeing was not a 35mm print but a restored print digitally projected, one which hopefully will be with us for many generations to come. 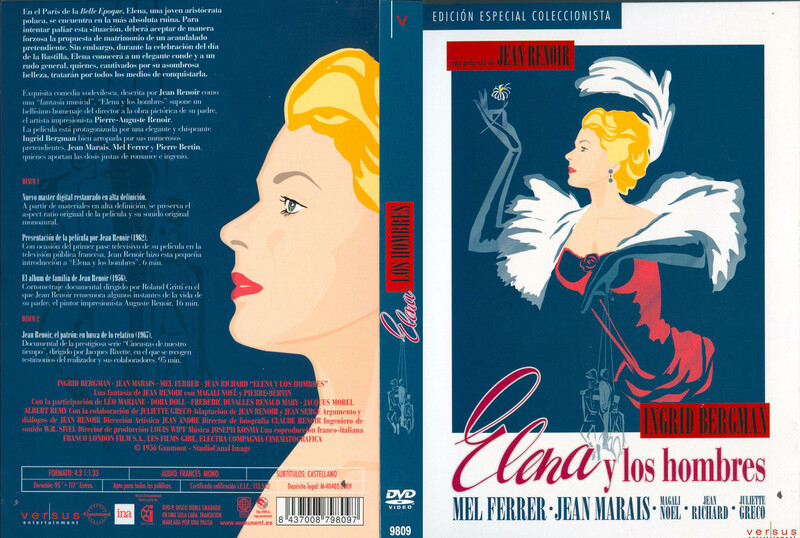 The program also included a thought-provoking quote from Jean-Luc Godard: ‘If Elena et les hommes is ‘the’ French film par excellence, it’s because it’s the most intelligent film in the world: Art simultaneous with a theory of art; beauty simultaneously with the secret of beauty; Cinema simultaneous with an explanation of cinema’. And here I was simply mourning, erroneoulsly, that future generations wouldn’t be able to see the glorious gradations of texture and colour in a hat.